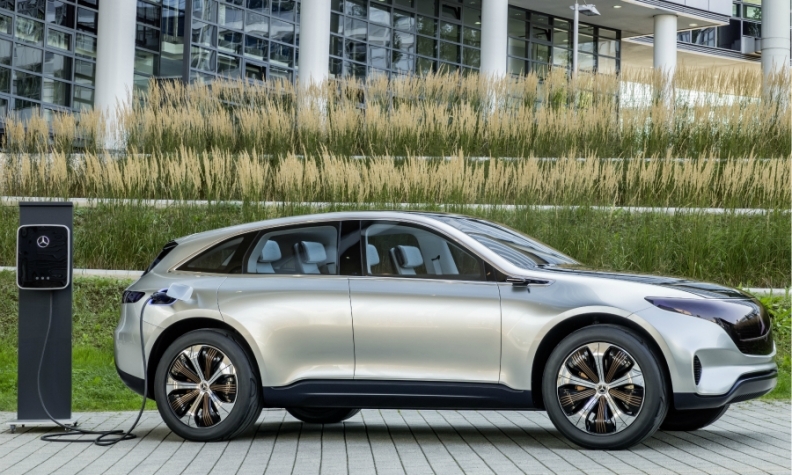 Daimler plans to launch Mercedes electric cars including an SUV based on the Generation EQ concept, shown. FRANKFURT -- Daimler could suffer a drop in production of Mercedes-Benz cars next month because of a dispute over the allocation of an electric powertrain between management and unions at a key plant. The works council at Untertuerkheim in Germany, home to Daimler's global headquarters, will oppose any overtime work from July 1 if management refuses to assign orders for development and production of an electric motor to the plant, works council chief Wolfgang Nieke said on Thursday. The factory at Untertuerkheim near Stuttgart employs over 19,000 staff who build engines, transmissions and axles for Mercedes. Workers fear that the plant may lose orders in future as Daimler is raising spending on electric cars that need motors which consist of fewer parts and require fewer workers on the assembly line. Untertuerkheim's transmission production would be particularly hard hit by the shift to electric cars. Factory managers want to continue talks with labor in a constructive way but realize it will not be easy to resolve the dispute, plant chief Frank Deiss said, calling on workers to be willing to make concessions as the plant shifts focus to battery-powered motors. Daimler expects to bring more than 10 new electric cars to the market by 2022, with the first model, based on the Generation EQ SUV concept, arriving in 2019.